﻿Have you ever kept a New Year's resolution for the entire year? Every January, millions of Americans make promises to eat less, exercise more and save for the future. But most resolutions are forgotten by spring. However, there are ten promises that relate to your financial health that you can't afford to abandon. 1. Make a financial plan. Creating a financial plan forces you to set goals and identifies a path to reach them. Your plan should combine general objectives — like your preferred retirement age and lifestyle. 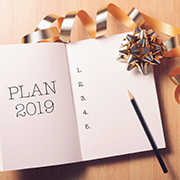 In turn, these general objectives will help you create a ballpark estimate for how much you'll need to save each year, and whether your current savings are on track to achieve those goals. 2. Seek input from a financial professional. A competent, ethical financial advisor can help you flesh out and achieve your plan. If you don't already have a financial advisor, look for someone with strategic and tactical advice on saving, investing, budgeting and managing financial risks. Even if you consider yourself savvy about money, prove it by sharing your detailed financial plan with a pro. He or she can give it a reality check and point out potential changes under today's tax laws. 3. Review financial plans annually. Expected rates of return and annual contributions aren't guaranteed, especially under volatile market conditions. Life circumstances also might change, such as having a new child or grandchild, getting laid off from a job or receiving an unexpected raise. If you veer off course, tactical adjustments might be needed to reach your goals. 4. Try to be fiscally responsible. It may be tempting to spend your 2018 bonus or tax refund on an extravagant purchase, like a new luxury SUV or multi-carat diamond necklace. But it's important to differentiate needs from wants. Hold on tight to your wallet and consult your financial plan before making a costly impulse buy. 5. Allocate investments based on age and risk tolerance. Asset allocation refers to the proportion of different categories of investments — stocks, bonds and cash-equivalents — in an investment portfolio. After deciding on the right asset allocation for your situation, align your investments accordingly. Thereafter, to maintain that balance, consider the need to adjust periodically for additions to your portfolio and changes in the assets' market values. 6. Monitor investment fees and commissions … and don't overpay. Studies of mutual fund investments generally don't show a consistent relationship between operating costs and return on investment. Unless higher fees result in a higher return, why would you agree to pay more for investment management services, brokerage commissions and mutual fund “loads” (sales charges) when you buy or sell securities? By minimizing these fees, you'll maximize the value of your portfolio. A few extra dollars here and there add up over time. 7. Become financially literate. Personal finance may be a tedious topic for some people. But a little knowledge can help you avoid mistakes and recognize opportunities. Financial literacy also provides the peace of mind that you're not just relying on gut instinct. Want to learn more? Stick to books and publications from reputable sources that describe trends and principles of personal finance. Avoid doomsday advice or too-good-to-be-true trends. With long-term investments, slow, steady and responsible usually wins the race. Financial literacy takes ongoing effort to stay atop new types of investments, market trends and changes in the tax law. 8. Purchase adequate insurance. Wise people expect the unexpected. Who expects to die young or become paralyzed in a car accident? While going through life with a sense of foreboding would be tragic, rose-colored glasses aren't the only alternative. Find a happy medium and insure yourself accordingly. 9. Pay attention to taxes. Tax evasion is criminal. But minimizing your taxes by legal means is smart. Although federal and state tax issues shouldn't drive every decision, they're an important variable to factor into the equation. Remember, the Tax Cuts and Jobs Act (TCJA) brought sweeping changes to the tax law that generally are effective from 2018 to 2025 for individual taxpayers. It's important to discuss the changes with your financial advisor to determine whether your current plans need to be adjusted. 10. Carpe diem. It's smart to have a financial plan and be fiscally responsible. But don't set your savings goals so high that you're unable to enjoy life today. Budget some discretionary (fun) money to spend on friends, family, travel, pets and anything else you love. There are two kinds of New Year's resolutions: Those you keep and those you quickly abandon. So, the ultimate resolution should be: I will keep all of my New Year's resolutions in 2019. Best of luck in the year ahead.